Barely out of the hospital for 48 hours, my beloved groom, Jon Hamilton, was hiding the PICC-line remaining in his arm underneath his wedding suit. He was so very ill that he laid down on the sofa in the minister’s office until time for the ceremony to begin. After sitting through 90% of the reception that followed our wedding, Jon needed to take a 2-hour nap before he had enough strength to leave for our French Quarter honeymoon. Even so, I still had to drive us most of the way to New Orleans. No, the man I married was not well. In fact, he hadn’t been well for a very long time. He was so close to death that a friend and I wondered together if there would be a wedding or a funeral. I know it’s rather obvious to say this but truly I’m so very happy that I can say we got our wedding! And four years later, I’m glad for the blessing to love him in sickness and in health … it’s a vow I plan to keep as long as the Lord allows. Initially, I had no idea what that promise would mean, how close we would come to not getting married, how near to death Jon would come. But the good news is that my guy survived the heart infection that almost took his life. And despite the fact that he should have died several times over, if you were to meet him today, you would never know he had once been so desperately ill. The only signs that remain are the nasty scar running down the length of his chest and an inability to digest gluten or dairy (which is a result of so many months of strong levels of antibiotics). A photo from our wedding … fortunately for us, it did happen! 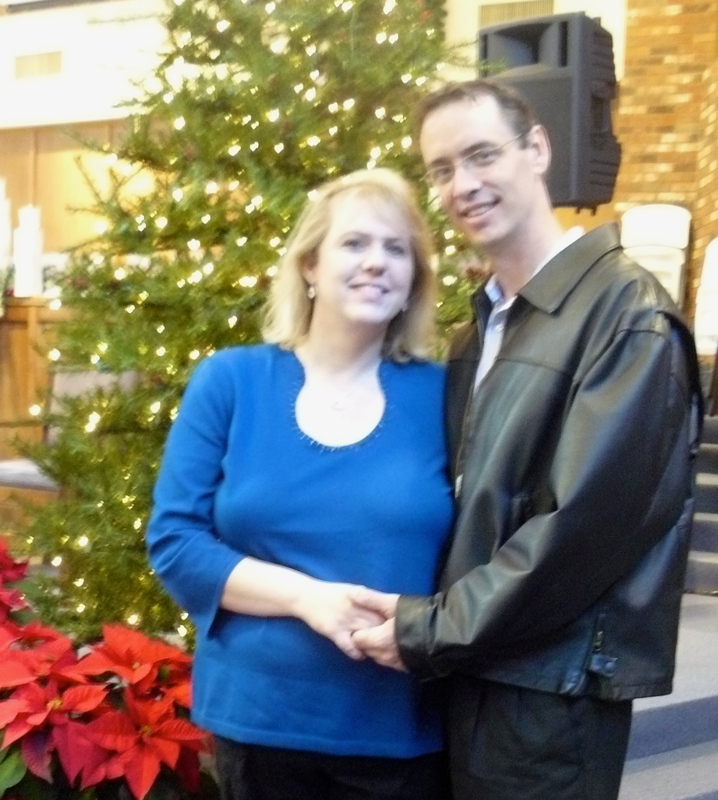 Three months before I started dating Jon, he had open-heart surgery to repair a leaky mitral valve. He was already a special friend, and so I remember praying for his recovery. But from the start, he seemed to being healing very slow. Within just a few days of returning home from the hospital, Jon began to experience night sweats and the fatigue which plagued him prior to the surgery only worsened in the weeks that followed. By the following summer, a year after the surgery, Jon was experiencing a long list of strange symptoms in addition to the fatigue and night sweats. He was pale, constantly ran low-grade fevers, would shake with several chills every nights, and his muscle and joints ached. Jon’s spleen was swollen and tender; he felt nauseous often. Even though he wasn’t trying to diet, his weight plummeted, going from 250 lbs prior to the surgery to hovering right around 200 lbs during the fall of 2010. Jon saw his cardiologist regularly throughout that year, though that doctor didn’t seem to think there was a problem with the heart. However, Jon’s family doctor was concerned enough to begin a battery of tests to try to determine the source of the illness. With a clean bill of health regarding his heart, Jon’s GP doctor began to look for other sources as the cause for the illness. Blood work. X-rays. CAT scans and MRI’s. Soon Jon’s medical team grew to include a hematologist, urologist and gastroenterologist. Test after test was performed; all came back negative. No leukemia. No colon cancer. While we were thankful those terrible fates were not Jon’s, our worried continued to mount for nothing seemed to be the cause of Jon’s mysterious symptoms. Although everyone seemed to agree that Jon was suffering from a serious illness, not one single doctor out of the many Jon saw for his medical care could figure out what was making him so very, very ill. But I knew … I knew only because God showed me. “Jon, it’s your heart!” I said time and again. Initially, I wondered myself if what I thought I knew was actually coming from God or if I was just as crazy as I felt. Then came the day when I received an out of the blue email from a lady who went to church with Jon. I only knew Catherine casually, but that day she reached out and asked me if Jon’s heart might be the cause of his illness. Old enough to be my own mother, Catherine’s friendship and concern was like a breath of fresh air in that scary place. Years before, she had lost her only son after he had surgery to correct a heart defect, so her understanding of heart-related illnesses and symptoms was great. Her deep faith in God was matched with her quick intellect and warm spirit. Soon Catherine and I were praying together for Jon’s health, and chatting regularly as we teamed together to try to figure out a way to get Jon to a doctor who could help cure him. 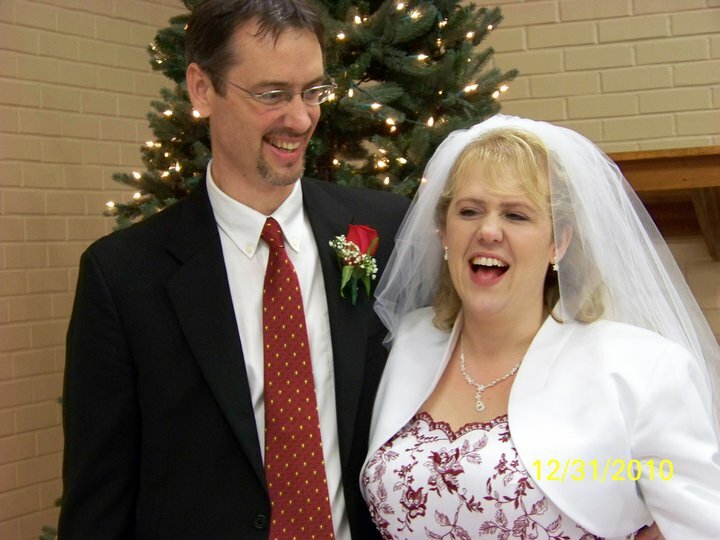 Most of all, Catherine served as an encourager to me, a bouncing board for all the multitude of emotions I experienced, for it was during that fall Jon proposed married and we set a wedding date for December 31, 2010. By early November, Jon seemed to be languishing. The fevers were stronger. He was napping more and more. My sweetheart seemed to be surviving on massive doses of Tylenol and Ibuprofen. One day, I noticed some tiny red spots at the ends of his fingers. Petechiae. Blood spots. Another symptom of a serious heart infections. A sign of tiny bits of infection vegetations were being dislodged into the blood stream. If a large enough piece broke away, it could trigger a stroke. But even Jon was still skeptical, siding with the doctors, refusing to consider that his heart might be the source of his illness. I begged him to get a second opinion from a new cardiologist, but Jon could not be convinced. And then, without warning, something happened in early December that caused the tide to finally begin to turn. “Did I tell you my index finger has a painful knot at the end of it? I’ve decided it must be ‘mouse finger’ … you know, because it’s probably just sore from using the mouse to my computer too much.” Jon laughed at his confession. Slowly Jon’s words begin to sink into my brain, as if for the first few seconds I couldn’t understand the words and what they meant. But then it all came together, so quickly that I gasped with a sudden realization. “Jon! You don’t have mouse finger … you have an Osler’s node!” This was it, the final symptom on the long list of symptoms for endocarditis. Now I knew with all certainty that Jon truly did have a heart infection. Mentally I made a list of all his known symptoms, and I felt like I was reading a page straight out of some medical text-book! If I only I could get him to see that I had been given this God-inspired information, then maybe he would seek out a second opinion. I breathed a quick prayer asking God to open Jon’s eyes. Jon’s voice broke through my racing thoughts. “Osler’s nodes? What are you talking about, Paige?” Jon was obviously confused and baffled by my reaction. With my encouragement, Jon arranged another appointment with his cardiologist, this time being sure to point blank ask him about the possibility of endocarditis as the cause all of his baffling symptoms. “I see no reason to believe that you have endocarditis. Everything regarding your heart still looks fine to me.” With that, the doctor left the room. The examination was over. Now Jon knew … he needed a second opinion, and he needed it quick. I didn’t know Beth Dooley, but I told Jon about Catherine’s suggestion. “Oh, yes! Beth. I should have thought about that. I’ll talk to her the next time I see her.” As sick as he was, Jon didn’t seem to be in a hurry. “Jon, can’t you call her now? I’m worried about you.” Every time I saw Jon’s glassy-looking eyes or gray-tinged skin, I knew his time was quickly running out. It was already mid-December, and more than ever I was wondering if Catherine was right. 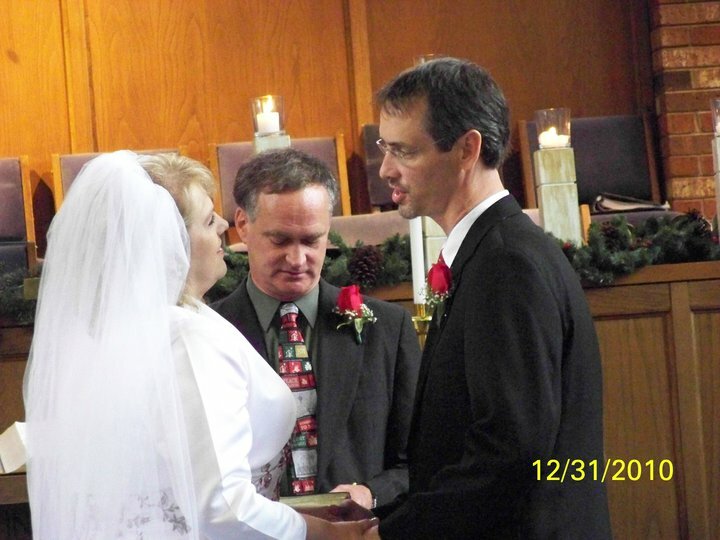 Would we have our New Year’s Eve wedding or would it be a funeral for my beloved instead? Jon and I, the day before he saw Dr. Coureville for the first time. When Jon called me with the update from his appointment, I immediately made plans to leave my north Louisiana home and head south. Despite Jon’s protests, I was going to be there for the procedure … to hear the results, to ask questions, to be informed about his treatment and recovery. After all, our wedding day was less than two weeks away. My heart sank again. It wasn’t just me. Others saw the reality of Jon’s illness too. And yet, there I stood in the cold December air, continuing to hold hands with a man who was closer to death than anyone I had ever loved before. And in that moment, I realized not a single part of me wanted to leave or run away. I was already in this, for better or for worse. 2 am: I awaken to the sounds of moaning. At first, I couldn’t remember where I was. I never slept at Jon’s house, normally staying in Catherine’s guest room. Slowly, I came to and remembered that I had decided to stay close to Jon that night, partly because I was so worried about his health and partly because Jon’s procedure was scheduled for 7 am the following morning. Tiptoeing into the living room, I saw Jon stretched out on the couch. His face appeared paler than ever in the soft glow of the TV. His hand was massaging his chest. His lips were moving, as if he were praying aloud. Jon noticed me and smiled. “I’m okay.” He said the words emphatically, as if trying to convince himself more than me. “In my chest. It’s burning … and radiating around to my back.” He moaned again. Thankfully, Jon got up off the couch. Together, hand-in-hand, we walked out of the house. As it turned out, Jon was already in the process of dying. His kidneys, liver and bone marrow were in the initial stages of beginning to shut down. Thankfully, team of doctors and nurses were able to reverse that from continuing to happen, though several people on caregivers admitted in hushed tones that we got him there just in the nick of time. “A few more hours and we may not have been able to stop the process from happening,” whispered one of our favorite nurses. Deep down, I knew she was being truthful with me. 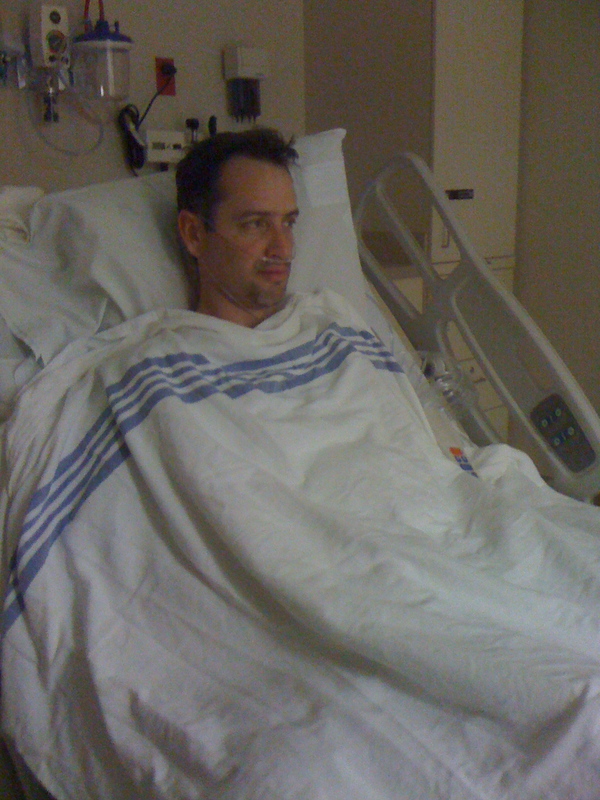 Jon really was almost too far gone when we arrived at the hospital. The TEE showed a vegetation of infection on his mitral valve the size of my pinky finger. It flapped around each time his mitral valve opened and closed, flinging bits and pieces of infection out into his blood stream. If the infection hadn’t managed to kill him, a stroke was literally just a heartbeat away from taking his life. 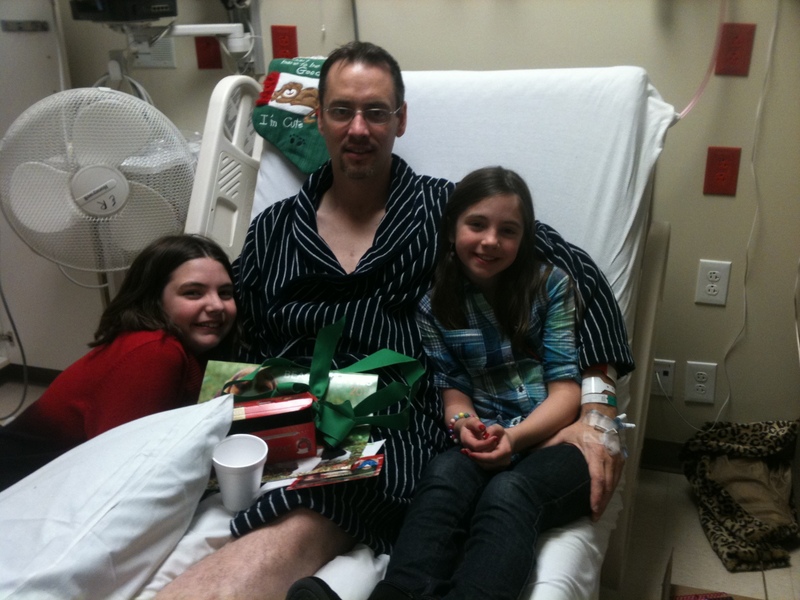 Christmas 2010 … spent in Heart Hospital. Jon’s girls came to visit him there. It was a Christmas we would never forget. Jon was released from the hospital on December 29th, his 41st birthday. He went home with a PICC-line inserted in his arm to deliver the antibiotics straight to his heart and the promise of a home health nurse who would be making daily visits to our home. Two days later, we had our New Year’s Eve wedding. It was the wedding that nearly didn’t happen. It almost was a funeral. But God intervened, at the last possible moment, and gave us a Christmas miracle we would never forget. Jon says his vows to me … second later, I promised to love him in sickness and health. The guests laughed with us, for we were all filled with joy over a wedding we thought might not ever happen. Of course, our medical story doesn’t end there. Jon ended up needing to have a second open-heart surgery a month after our wedding because the infection wouldn’t clear up with antibiotics alone. His old infected mitral valve was removed and he got a brand-new teflon version that clicks rhythmically with each beat of his heart. 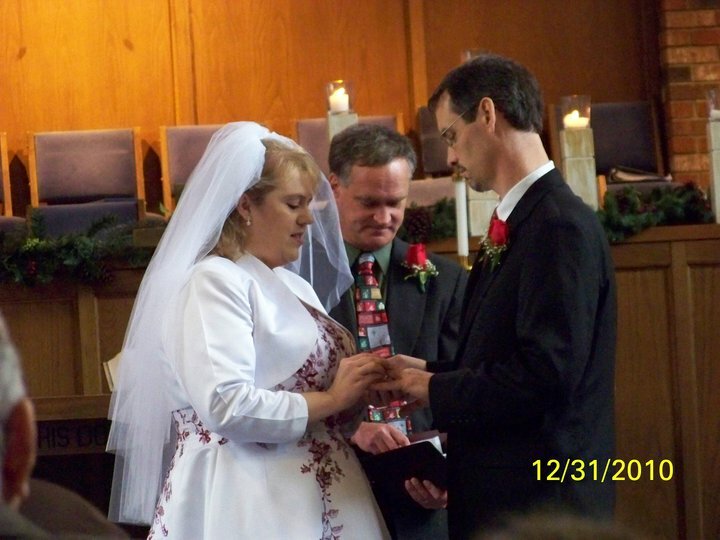 I love to lay in bed in the quiet of the night and hear my husband’s heart ticking softly, reminding me of all God has done for us, including the story of our wedding and how it almost didn’t happen. And as I fall asleep listening to the tick-tick-tick of Jon’s heart, I’m so very grateful that it did. Thank you, Kim! God bless you this year! This is such and amazing story! I I even learned a few things about hearts I Googled Osler’s nodes, because I wanted to see what those look like and also the blood at the tips of the fingers, I had no idea that that sort of thing could happen. I am glad your wedding did not turn into a funeral and I hope you all have many many blessed years together. Thanks for sharing your story I truly enjoyed reading it. Happy New year and God bless! Every time I share the story, I get all teary and my arms cover in goosebumps. Thanks for reading it … I love to tell it because it means so much to me. 🙂 Happy New Year! Such a precious time even amidst the difficulties!!! I’ll never forget! Both of you are very special to me! Have a great Birthday and Anniversary. I’m so proud to have shared in your courtship, wedding, and friendship. We love you too, Catherine! It was a very difficult thing to watch, as the doctors repeatedly failed in helping Jon. One of the reasons he was so reluctant to share how bad he really felt was because several doctors initially didn’t take him seriously and sort of brushed off his complaints as being those of a person with hypochondria. I’m just glad that God allowed him to live … Jon is surely a blessing to me! How beautiful that God has brought you through this. Thank you for sharing. I’m reblogging. This is important information. Someone else out there may be going through the same thing. It is a scary thing to experience! Endocarditis is not something to play around with at all. Thank you for reading and sharing! If you or someone you know is having these symptoms, please tell your doctor about it before it is too late. What a beautiful story. Thank you for sharing it! It goes to show there is strength in love. I’m glad you enjoyed it! At the time, I would have never said this but four years later I’m thankful for the experience and what I learned from it.